I'm going to take just a bit of time to illustrate for you a particularly prevalent celebrity logical fallacy. This is called a false appeal to authority. It's when someone presents an opinion by someone else who is in turn presented as a "trusted source"... a source who by education, training, and/or experience can give accurate information. In the advertisement above, Peter Bergman is not a doctor. Whatever the benefits of the product are, he's no more qualified to expound on them than any other paid spokesman or consumer. The qualifications he assert ("I play [a doctor] on TV") are irrelevant. In the Vicks 44 commercial, Peter Bergman did not make that false appeal: the ad writers did. They chose a spokesman that many people in the audience would have seen in a medical setting, acting like a competent doctor. Bergman is there to gain the trust and acceptance of the audience due to this familiarity. Fundamentally, a false appeal to authority is an emotional appeal, not a logical one. Now, what he says about healthcare and a space force may or may not be true. It's not the purpose of this essay to determine that. What I am addressing is the fact that Scalzi is no more qualified to say it than you are. The only part of this statement upon which he's an authority is "I FEEL". Scalzi is indeed a science fiction writer. He has indeed won a Hugo award. It is not my purpose here to criticize his writing skills. But those skills do not translate into real-world expertise in either healthcare or military matters. Nor does his non-fiction writing give a hint of any hidden qualifications in these matters. 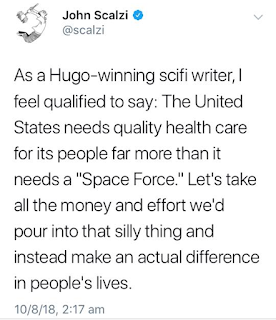 And if he'd stuck to his qualifications and simply said, "I feel that the United States needs quality health care for its people far more than it needs a 'Space Force'", I wouldn't be writing this post. So how can a presumably intelligent human being make such a mistake? I can speculate about two reasons. One is subliminally disingenuous. He is trying to persuade, and if a reader is balancing on the fence, perhaps adopting a false air of authority will pull the reader to his side. The second is that he may actually believe himself to be an authority. Reality can be a dangerous thing for fiction writers. It's not their stock in trade. They make up the technologies they write about. They make up the aliens, the politics, the conflicts, the resolutions. They may write on behalf of characters who are flawed but the authors themselves control those flaws... and strengths. A fictional character achieves what the author wants him to achieve because the author wants him to achieve it. Even the physics of science fiction bend to the will of the author. Whenever a science fiction writer utilizes "technologies" such as faster-than-light travel, he or she displays a willingness to set aside reality for the purpose of telling a story. That's a lot of control. It's a lot of power. It's certainly seductive to imagine that one has as much control and power over the real world. Unfortunately the real world is not as accommodating as a word processor. 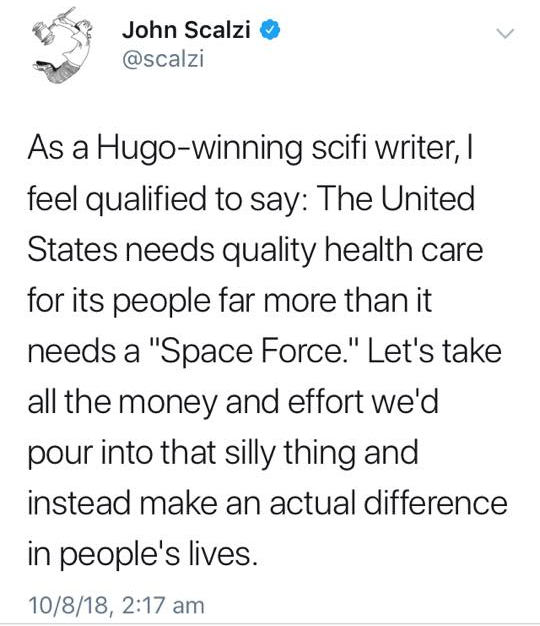 Scalzi does correctly state that his actual qualifications are that he writes science fiction. We know that this indicates a willingness to set aside reality for the purpose of telling a story. We also know that a false appeal to authority is an emotional appeal. And we know that intelligent people know their limits. I'm giving Scalzi the benefit of the doubt when I assume that he chose to step outside those limits. Whether what he says here is correct or not, such "qualifications" cannot gain him non-skeptical agreement on logical grounds. By the way, this isn't the only logical fallacy present in this tweet, but I leave it as an exercise to the reader to identify the others. You shouldn't need an expert, as logic is something that can be practiced by any competent human brain. Definitely a cogent and rational examination of events. Those of us who write fiction are all welcome to our opinions, but the fact that we make a profession out of entertaining people does not grant us any special authority.